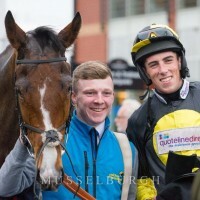 Mister McGoldrick – His Big Day! From August 2000 until December 2011, during his 91 race career, Mister McGoldrick became one of the most popular horses of his time. The public ever increasingly warmed to his style of racing, winning well, yet never going down without a fight in defeat. Then finally, after many near misses, in March 2008, aged eleven and at the twilight stage of his career, he had his well deserved day of glory, by winning the Byrne Group Plate at the Cheltenham NH Racing Festival, the worlds most prestigious National Hunt racing event. Click on the arrow above and watch the final stages of this race….a sight which, many years down the road, still takes my breath away, as he powers clear of his rivals to win by 13 lengths. Then read more about Mister McGoldrick on his own page of this website. Just a small snapshot maybe, but just look at the amazing landscape which Mister McGoldrick wakes up to every morning….. and there`s still hundreds more acres of land, which you can`t see !! for “Mac” and his resident mates at New Beginnings to run loose within. It’s absolutely, totally idyllic, especially on a summers day, and thanks to Pam and Trevor at New Beginnings for looking after “Mac” and all the horses in their care, with such kindness and dedication. Please click on the horses name for more details.